Enjoy significant discounts on regular rates when you reserve for 30 days or more at Villa Corona del Mar. Villa Corona del Mar’s Bungalows are small casitas that offer full kitchens and patios and are separate from the main Villa and Hotel. 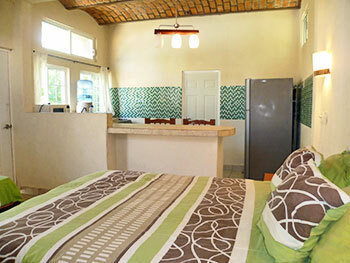 Bungalows are best suited for guests who wish to prepare their own meals or who just need more space. The Big Bungalow has two separate rooms each with a king size bed and a sofa that could be used for a teenager or child. The Bungalow also has a dining area with a table for 6 persons,bar area and sitting area.The private bathroom has a shower,toilet and sink.Air Conditioner and Casablanca Fans.Sleeps 4 to 6 persons. The small Bungalows are an excellent choice for those looking for privacy yet need a kitchen for preparing their meals. The Small Bunglows are separate from the Villa and Hotel and are located near the tennis court and restaurant view. king size bed in the main bedroom area and one sofa located out in the dining area. Air Conditioner and Casablanca Fans. Sleeps 2 to 3 persons. Our oceanview rooms all have wide, views of the Bay of Jaltemba,Isla Coral and the beach of Rincon de Guayabitos.All Oceanview rooms have private decks with two chairs and a table.Each room has a king size bed and private bathroom.There are no kitchens in the rooms and these rooms are recommended for persons wishing to dine out on a nightly basis.Air Conditioner and Casablanca Fans. Sleeps 2 persons. Rates include daily housekeeping and use of amenities. Rates do not include daily breakfast. However, daily breakfast can be arranged at an additional cost. Visitors, friends or additional family members may come visit but must be pre-approved by Administration to use the facilities or stayover. Typically, there will be a nominal charge for additional persons staying over or using public facilities such as pool and tennis court.